I got a PM from someone asking a genuine question. After writing my response I thought it was something that I'd share with every other PSC "newbie" (not the same as a noob or n00b or you nubie ). These were things I'd heard when I was a newer newb than I am now. There are several artists (known as "choppers") here whose skills put them in the category of "freaks of nature". Many of these people are professional artists that use Photoshop on a daily basis. So yes they've usually had classes/training with Photoshop. They know their stuff and are the ones that will give you the best pointers and tips if you heed them. Others, like me, are hobbyist choppers. But that doesn't mean we can't do well around here. If your idea for a chop is good enough, and you put enough effort into it, it will usually do well here (even if imperfect). Several of the most successful choppers around PSC did not start out as professional choppers. 1. Never be too scared or intimidated to enter a contest. If you've got an idea then do it without regard to worrying about how it will do against other entries. 2. Don't get discouraged if your chop doesn't do as well as you think it should have. Late entries rarely ever do well as they just don't get the exposure that the other entries did. Think of PSC like school. You don't start out as a child expecting to get your PhD on the first day. Many of the really good artists here put their time in to learning outside of PSC. 3. Search for, read and DO tutorials on effects and techniques that interest you or are geared toward something you're trying to do in a chop. Learning by doing is the best (and fits well with item 1). 4. If you don't know how to do something ASK. There are some really great people around here and they'll help you. But you have to ask for the help first (usually). If they see that you're putting the effort in then they'll help. If you're looking for a free ride then you'll get ripped to pieces. 5. Don't "vote whore". Vote whoring is PM'ing people with messages like "please look at my entry" while the contest is open (or posting to the forums or chat with the same message while the contest is open). People don't like it. There are some who'll help you before a contest is open (once they get to know you). But if you want people to give feedback on your chop then put your own comments requesting such help with the chop itself. Some will give feedback and others won't. As an aside to this you can, in my opinion, solicit people to look at a chop AFTER the contest is over. Then there's nothing to gain but the advancement of your skills at that point. 6. Have fun. This actually has three parts. Used to be two but now it's three. 6a. Take part in the forum "contests" that pop up. There's crazy fun chopping to be done in the forums (and Advantage chat if you pony up the money). Doing these chops can sometimes teach you skills you wouldn't have thought of doing a contest entry. 6b. Remember that this place is ultimately a diversion from the real world. If you start taking it too seriously you're gonna just be a miserable grouch (and we do have a couple of those around here ). 6c. Before you bring up ideas to change the voting, change the contests, or change how the site works. PLEASE SEARCH THE FORUMS! We've talked about these things ad infinitum. If you have a truly original idea we're all ears. But if it's an idea that's been brought up before then you'll get eaten alive. This can interfere with 6c. 7. STFUAC. If you don't know what that means ask around. This really speaks 2 me. ESPECIALLY since I cant figure out how 2 make it look like my picture has "horns" in her skin. exactly where would I post a "need help on design" thing at? its driving me crazy that I cant figure out how 2 do it. any help would defiantly help. Preciate it Shaman, that's what i figured. But it seems like alot of these pics are done with something other than photoshop? Is that right? pretty much its up to you what programs you use.. its all about the photo manipulations. We Gimpers are still around- that coulda been stated better. 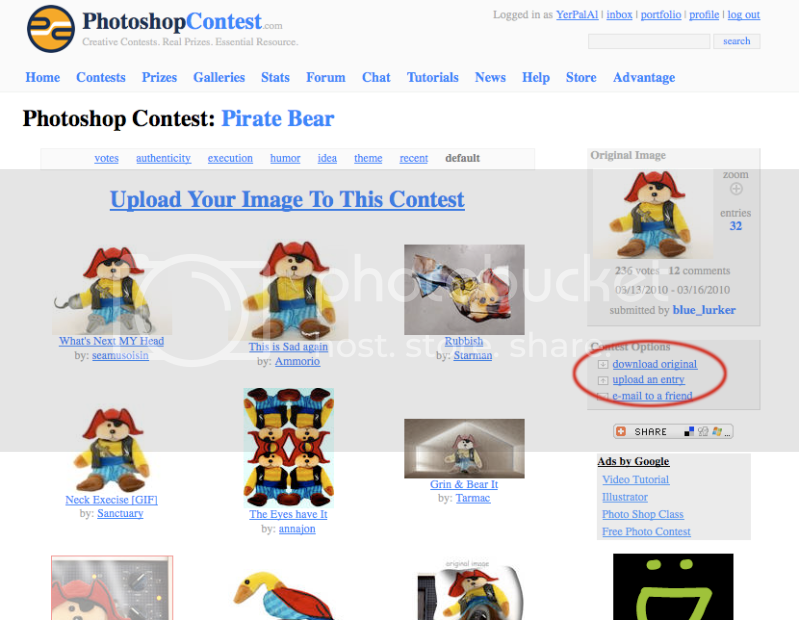 Hey , i want to participate in your ps contests..
but when i click the contest button it tells me i have to pay to play? am i going to the wrong section ? or do i have to pay a membership fee to join in the contest? Here you can download the source image to work on and up load your entry when ready. I thought I would bring this to surface again for the newest newbies buzzing about.